So, today seems to be the Day For Furniture and Housewares That Knit. After I posted yesterday about Siren Elise Wilhelmsen’s “365” knitting clock, Gizmodo published a post about another imaginative use of knitting in a design thesis project: Damien Ludi and Colin Peillex’s “Rocking Knit,” a hat-knitting machine powered by human muscle, that is, a rocking chair. You sit in the chair, swing back and forth, and the movement you generate propels the knitting machine above your head. Its creators call this process “productive moments of relaxation.” I guess all crafters know all about those moments…. 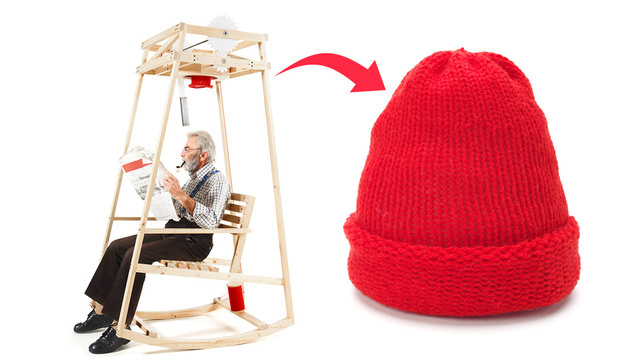 This Rocking Chair Knits a Wool Cap While You Kick Back and Relax. enjoy seeing underwater creatures and swim with them. monsoon months, there are advantages and disadvantages to both that you should take into account. A boat ride in this electrifying place will certainly be one of the most remarkable rides you might have experienced ever. Quality content is the main to be a focus for the users to pay a visit the web page, that’s what this web site is providing.